On a June morning, I struggled my way through the wetland margin of the Laas Tamarack. 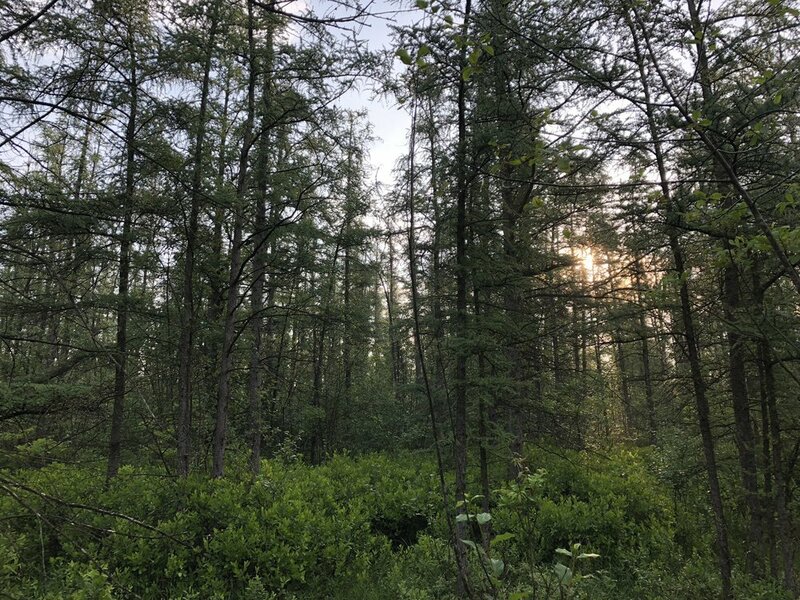 Wanting to find what breeding bird species resided in this largely inaccessible and otherworldly tamarack bog, the allure of the unknown was soon filled with regret and rubber boots full of murky bog water. This was to be expected. Many of the birds I heard and saw were also expected: yellow warblers, robins, gray catbirds, red-winged blackbirds, common yellowthroats, cedar waxwings, chickadees, wood ducks, and a green heron. Delightful, no doubt, but they didn’t include any of the hoped-for birds, like a mourning or Canada warbler, or a white-eyed vireo. The sunrise through the tamaracks, in combination with the morning dew, gave the needles a bluish tinge. Meanwhile I appreciated the treasures of the bog: pink lady’s slippers orchids, unique sedges like cottongrass, and blueberry and huckleberry. Of course, the hummocks of sphagnum moss offered a delightful color palate of red, green, and brown; while also varying the topography so that I had to listen for rare birds instead of also looking for them. After wandering around the outskirts of the tamaracks and appreciating the sunrise, I stopped and touched a particularly burly young tamarack. From this tree, at about eye level, flushed a good-sized bird that jolted me back from the tree; a moment later I realized it was a black-billed cuckoo, and a moment after that I saw it had flushed from its nest. Here was a delightful find! The nest defied the warm and homely expectation of care instructions for eggs. Instead, the black-billed cuckoo that I found opted for a few sticks crudely stitched together in the crook of the tamarack. I would not make it back into the tamarack to monitor the nest, but with a frail gust, those eggs could have easily tumbled to the ground. This type of nest construction is actually typical for black-billed cuckoos. While cuckoo relatives in England will parasitize the nests of other birds, the black-billed is less likely to do so, but still has been known to lay eggs in the nests of other birds. I’d like to think the cuckoo, upon finding the nest of a robin and envious of the cozy design, decides instead to squat its eggs in the more hospitable robin nest. Cuckoos, more often heard than seen (with their three-noted coo-coo-coo), thrive in brushy and gangly thickets. Where I found this cuckoo nest, I had to cross a wetland edge of a few feet of water, then stumble my way through an almost impossibly thick maze of shrubs and small trees. This is just how the cuckoo likes it. Where I’ve encountered cuckoos in thickets, they’ve been hilariously hard to spot. I might excitedly point out the bird to our summer interns, only for the bird to sit still for minutes on end. When it starts moving again, it’s still hard to spot with its brown to olive plumage and namesake black bill, but a white underside and red eye ring reveal flashes of this brilliant bird. I recall one summer when I looked at a black-billed cuckoo with the interns, and the bird seemed to mirror our movements through the brush. Here we were, hunched over and rocking our head every which way, and there went the cuckoo, looking at us, moving quickly in short spurts and navigating the jungle of brush. During the breeding season, black-billed cuckoos are relatively common throughout Wisconsin. However, indices of population from breeding bird survey routes suggest a steady decline of the cuckoo population in Wisconsin. Since habitat in Wisconsin is sufficient to support this species, it is thought that spraying for gypsy moths might affect food availability, or pesticide spraying may kill caterpillars and thus eliminate an important food source. Cuckoos love caterpillars, and where you have an outbreak of caterpillars—especially tent caterpillars—you will often find cuckoos. Breeding bird survey data from Wisconsin reflects this element of cuckoo ecology, as the density of black-billed cuckoos is highly variable, and peaks every 8 or 9 years, almost always coinciding with a caterpillar outbreak. One interesting adaptation that black-billed cuckoos have to eating sometimes spiny caterpillars is that they shed their stomach lining, coughing it up in a pellet. You won’t be able to find any cuckoos right now at Faville Grove, and you’ll likely have to wait until mid to late May to see one, but North Shore Road is a reliable spot to find this secretive bird. Terns are in the same family as gulls and skimmers, and 40 tern species are found worldwide. The arctic tern migrates from Antarctica and back again over a six month period. Their journey is not necessarily in a straight line, and on average the round trip migration distance covers an unbelievable 44,000 miles. All four tern species regularly found in Wisconsin, Forster’s tern, black tern, common tern, and Caspian tern are listed as state endangered. Wisconsin DNR and other groups have developed innovative ways to assist these species, and particular progress has been made with Forster’s terns. The Forster’s tern is a colony nester. Bird colonies are usually found on sites that are well protected from the usual terrestrial predators. Because colony nesting birds only congregate for a small portion of the season, local predator populations do not boom as they might with a permanent high energy food source. Forster’s terns breed in large marshes with abundant emergent vegetation, and most of the breeding population in Wisconsin inhabits the east central portion of the state or lower Green Bay. In pre-settlement days, an estimated 10 million acres of wetlands existed in Wisconsin according to Wisconsin DNR. Around 50 percent of those acres were destroyed because of conversion to agriculture, urban area, or other uses. Some colony nesters have a remarkably high site fidelity, meaning that they return to the same breeding site year after year. Forster’s terns are more nomadic than others in this sense. They require specific water levels for optimal nest success; plenty of water to maintain prey populations and deter predators, but not so much that their source of cover is below the water line. Historically Forster’s terns had many more options when choosing a colony site. Greater habitat choice led to more successful nests and higher populations. Because of low nest success and declining populations, the Wisconsin DNR began deploying nesting platforms for Forster’s terns in 1983. Nest platforms provide high quality nesting sites when natural substrates are of low quality or in short supply. 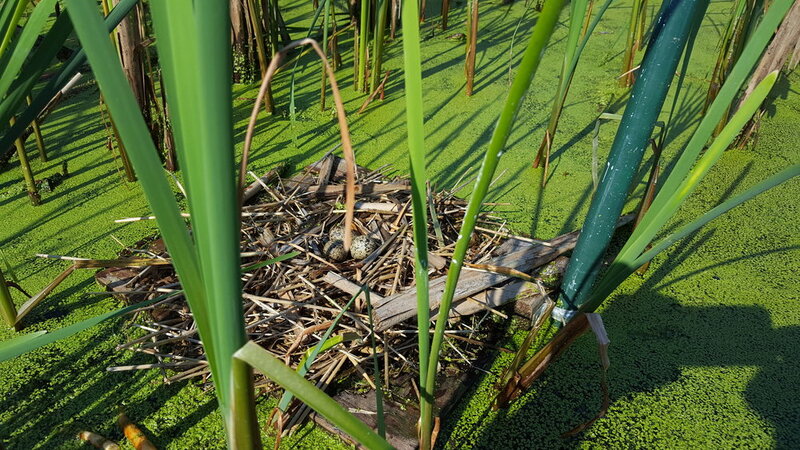 After eggs are laid, rising water can easily submerge nests. Fluctuation in marsh water levels is likely exacerbated by hard surfaces and row crop cultivation due to their low water infiltration potential. Nesting platforms float on the water surface. They are attached loosely to a pole which allows them to rise and fall in response to changing water levels. Nesting platforms significantly increase nest success, and 100 percent of deployed platforms were utilized by terns in 2018. This year at Lake Puckaway, 200 breeding pairs produced 259 eggs without the assistance of platforms. At Grand River Marsh, 19 breeding pairs that were occupying tern platforms produced 58 eggs. This means that breeding pairs of Forster’s terns were able to produce over two times the eggs using platforms than on natural substrate. Lake Puckaway flooded after this nest survey was completed, and all eggs were lost. Forster’s terns do renest, but their egg production decreases after each nesting attempt. The Wisconsin DNR plans to increase the number of tern platforms to 150. Ryan Zabs, a Sun Prairie Eagle Scout, reached out to Goose Pond Sanctuary in search of his final Eagle Scout project. He helped us take a huge step towards those 150 by building 50 platforms in a single weekend. Sumner Matteson with Natural Heritage Conservation Bureau at WIDNR generously provided funding for the platform materials. While the success of tern platforms certainly is exciting, it must be noted that this is not a permanent solution. Continued restoration of large wetlands and further protection of coastal wintering grounds is the best hope to keep Forster’s terns on the Wisconsin landscape now and far into the future. The brown creeper, more evident now than perhaps at any time in its life cycle, remains a cryptic bird even as bird density has thinned considerably due to migration south. 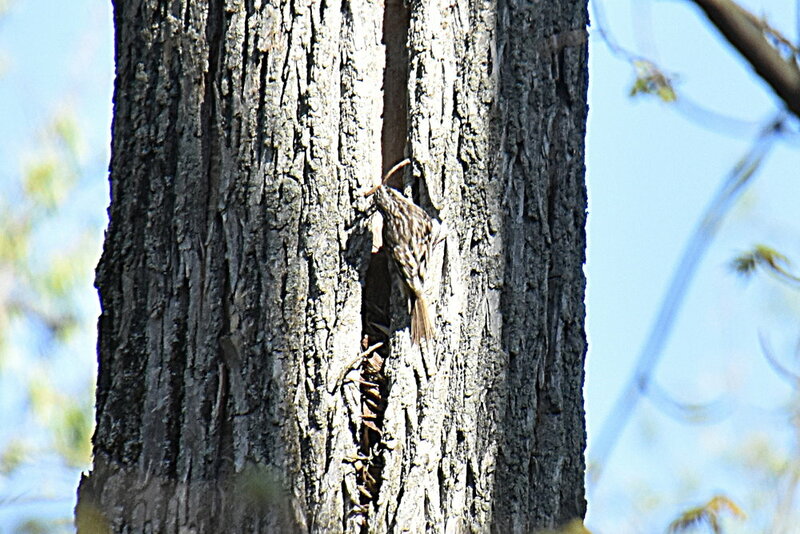 When threatened, brown creepers stay incredibly still, and their perfectly camouflaged plumage so matches the bark of trees that a still brown creeper can easily be mistaken for a leaf or peculiarity of the bark. 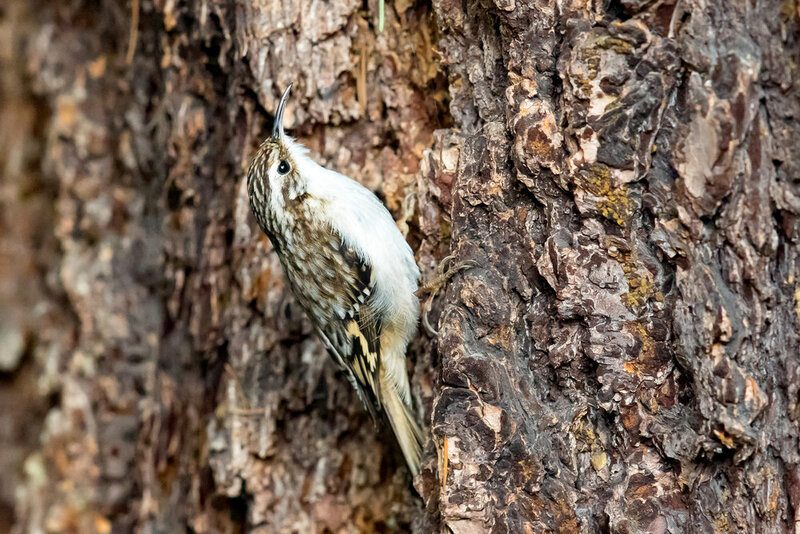 The secrets of the brown creeper intensify during its breeding season. Preferring bottomland forests of silver maple and elm, it is possible to find breeding birds in southern Wisconsin, though unlikely. In Wisconsin’s second Breeding Bird Atlas, Jefferson County only recorded one breeding pair, along the forested bottomlands of the Rock River as it enters Lake Koshkonong. Other breeding records in southern Wisconsin are rare, with scant records in lowland forests and bottomlands. Brown creepers construct nests in a unique way; they layer cocoons and spider egg cases together with twigs and strips of bark, and almost all records have the placement of the nest behind a strip of bark hanging off a tree. Because of this habit, creepers need forests with old growth characteristics, with plenty of standing dead wood to provide excellent foraging and nesting opportunities. In fact, in western US forests, brown creepers are considered an indicator species of old growth forest because they prefer a dense upper canopy and tall trees—almost 50% taller at occupied versus unoccupied sites. Using their long bills to pry away strands of bark is a favorite activity of creepers, and their process of foraging involves starting at the base of the tree and moving upward, then diving to the bottom of the next tree. Some research suggests that brown creepers exhibit habitat partitioning with co-occurring birds like nuthatches. Creepers will forage lower on trees and on thicker branches while nuthatches prefer slimmer branches and higher points of the tree. However, in areas where forest has been fragmented or logged, the brown creeper has been shown to be in competition with these other species. Thus, large blocks of forest with large diameter trees are important to both overwintering and breeding grounds. You can find brown creepers throughout Faville Grove Sanctuary, wherever there are good-sized trees. It’s rather rare that they use their high-pitched call during winter, so you’ll have to methodically scan trees in order to uncover this secretive species. Brown creepers will also frequent residential areas, again where large trees occur, so you might see them around your backyard. Recently we observed a house finch at our bird feeder with puffy red eyes. Something was clearly wrong. This distressed individual prompted us to learn more about these urban birds and their reputation for contracting eye diseases. Before the house finch range expanded to southern Wisconsin in the 1980’s and 90’s, it was easy to identify purple finches. While they do appear similar, a side by side comparison helps immensely with differentiating the two species. Purple finch males have a striking purple head, a larger bill, and wing feathers that are edged in red. House finches are native west of the Rocky Mountains. In the 1940’s and 50’s, many Americans achieved a standard of living that allowed them to buy pets. Wild house finches, marketed as Hollywood finches, were trapped illegally in southern California and shipped to Long Island, New York. A birder recognized house finches in a Long Island pet store, and reported the situation to the Audubon Society. This news was passed to federal officials, and unscrupulous pet store owners shooed their loot of house finches into the streets to avoid prosecution. Stan Temple, in 2006, wrote the house finch section in the Atlas of Breeding Birds of Wisconsin, “This remarkable range expansion has to be regarded as one of the more significant ornithological phenomena of recent decades.” In Wisconsin there were a few sightings in the 1970s. By 1986 they were added to the Wisconsin bird list. We found our first house finches in 1990 on the Poynette Christmas Bird Count. Researchers estimate that there are around 34 million house finches in the U.S. Temple mentions one reason for their explosive population increase is that birds can nest from late March to early September, and that most pairs raise two to three broods with four to five young. In Breeding Bird Atlas I from 1995-2000, house finches were found in 61% of the priority blocks, and at the end of year four in Atlas II they have been found in only 29% of priority blocks. 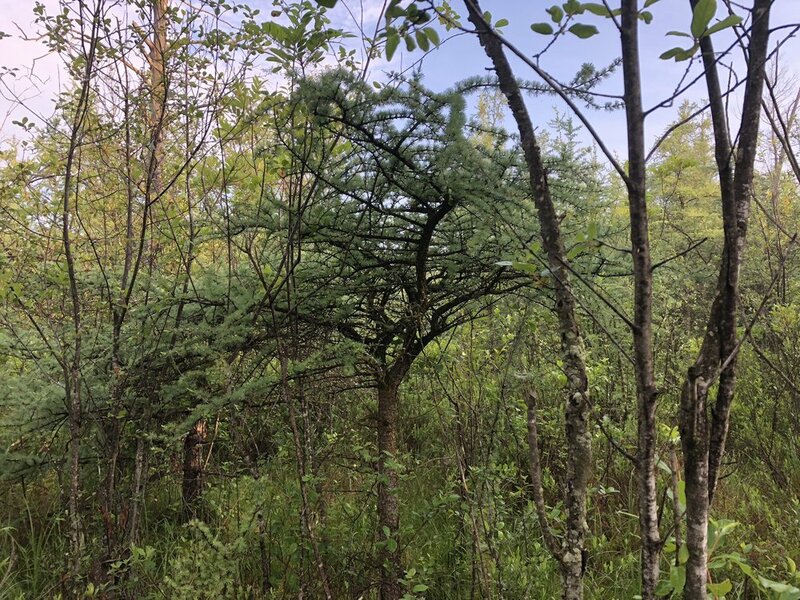 It appears that their range has increased in some areas, however it recedes in others, and they are still uncommon in forested areas of northern Wisconsin. Populations of house finches suffered a steep decline beginning in January 1994 as a result of a contagious disease called mycoplasmal conjunctivitis. The disease causes respiratory problems and red swollen eyes, making them susceptible to predators and adverse weather. Luckily it’s not harmful to humans. The disease is easily spread by birds feeding at tube feeders that offer Nyjer and hulled sunflower seeds. House Finch conjunctivitis was first observed at feeders in the Washington, D.C. area. Temple stated that conjunctivitis spread through the population as rapidly as the population spread through the eastern U.S. So what is a bird feeding enthusiast to do? We want to feed birds for a variety of reasons, but we do not want to spread disease to birds who share our feeders. A call to Pat Ready, MAS member and volunteer provided the answer to the problem. Wild Birds Unlimited offers their “Eco-Clean” line of tube feeders which feature a product called Agion. We have now purchased these feeders to replace all of our old tube feeders. The feeders are coated with Agion which starves bacteria of oxygen and inhibits bacterial reproduction. The feeders are costly, but we want to maintain a healthy bird feeding community, not one that spreads disease to our flock. 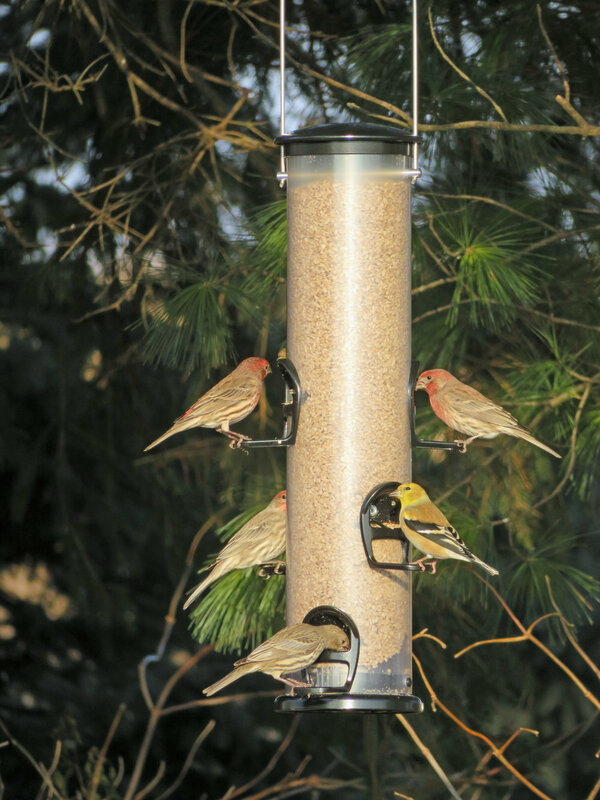 Wild Birds Unlimited is the only place where EcoClean feeders are sold. We enjoy watching the house finches at our feeders, listening to their songs, and observing them nest around our residences in hanging flower baskets. The black-capped chickadee is one of the most common birds in the northern United States, and one of the most extraordinary. Not to say other birds are less extraordinary, rather their capabilities have not been realized to the degree with which we have studied the black-capped chickadee. Case in point: a 362-page book on the species, The Black-Capped Chickadee: Behavioral Ecology and Natural History. Most impressive, perhaps, are studies of black-capped chickadee songs and calls that have uncovered a vast treasure of meaning. With over 16 different vocalizations, chickadees can communicate a wide variety of information. For instance, the “fee-bee” call indicates a male’s territory and attracts mates. That familiar “chick-a-dee” song conveys a number of messages to wintering flocks of chickadees; the number of “dees” at the end is associated with the threat of the predator. Smaller raptors like cooper’s hawks and kestrels register more “dees” than a red-tailed hawk or great horned owl. Research has also shown that the chickadees are responding to cues of bird size and even species; when bobwhite quail were placed with chickadees, no alarm calls were made. Thus, a single call (“chick-a-dee”) not only indicates a threat, but it indicates a threat to a certain degree. While this alarm call obviously alerts flocks of chickadees to predators, it also calls to action nearby birds of the mixed flock. Nuthatches, woodpeckers, kinglets, and creepers will respond to these calls and mob predators. Black-capped chickadees overwinter in Wisconsin, and for such a small bird to survive the cold turn of the seasons, it has to develop remarkable adaptations. While the summer diet of black-capped chickadees consists almost entirely of insects, and mostly caterpillars (you can help chickadees with those caterpillars, according to recent research, by planting mostly native plant species), winter chickadees feed on about 50% plant matter. 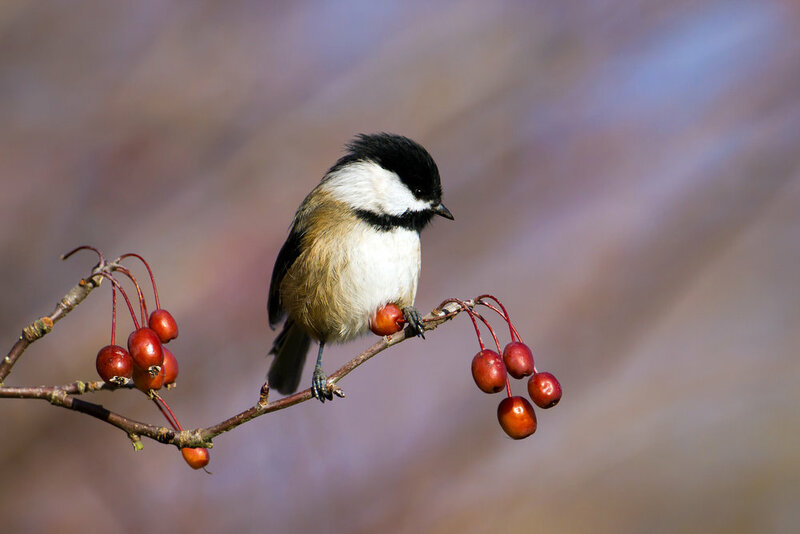 In order to prolong certain available foods items, chickadees cache food in crevices and cavities in trees. Over the course of fall and winter, chickadees will cache and retrieve thousands of food items. In one study, black-capped chickadees retrieved preferred food items over non-preferred types. This same study found chickadees to have episodic memory, able to discriminate using both time of day and elapsed time to determine where the freshest mealworms were located. These are remarkable findings of such a small, often overlooked bird. Adding onto these studies, further research has proven an expansion of the hippocampus, important for spatial organization and memory, in black-capped chickadee during fall and winter, increasing volume of the hippocampus up to 30%. By caching an extraordinary number of food items, these chickadees achieve brain growth during adulthood, a unique and resourceful adaptation. I envy the plasticity of the black-capped chickadee, for fall seed collecting at Faville Grove might become much easier with a hippocampus a third larger than my spring and summer brain. I value the chickadee for its soulful winter song, a cheery and longing embrace of December. You can find chickadees throughout wooded areas of Faville Grove Sanctuary this winter. When you observe these birds, try to recall all of these amazing facts about the black-capped chickadee, and realize that the chickadees you are watching might be retrieving, from a catalog of thousands of seeds, a specific dogwood berry, which will provide the bird with just the right fat content to survive the coming cold front.